Artists are often pigeonholed based on the type of art they did during a particular phase of their career. That’s understandable, since the paintings of planes, pilots and crews he has created during the past two decades are considered masterpieces of the genre. His aviation paintings and prints are prized by collectors, sold by galleries in the US and the UK and featured in the recently published book Gil Cohen: Aviation Artist. Of course, Cohen hasn’t always been known primarily for his aviation art. Some people know him more as a vintage pulp paperback cover artist. During the 1970s, 1980s and early 1990s, Cohen created cover art for many different types of books. He’s especially well known for the cool covers he did for Don Pendleton’s long-running series of action-adventure novels featuring Mack Bolan, The Executioner. 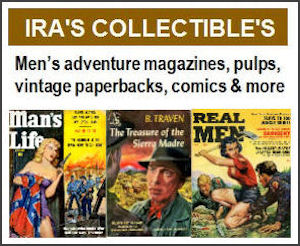 Other Gil Cohen fans know him primarily as one of the best of many great artists who did cover paintings and interior illustrations for men’s adventure magazines from the mid-1950s to the mid-1970s. That’s how I first became one of his fans. I recently had the pleasure of talking with Gil by phone at his home studio in Bucks County, Pennsylvania. Naturally, I asked him a lot of questions about his work for men’s adventure magazines and he was happy to talk about that phase of his career. COHEN: You know, I’m still active. Absolutely. And, I love your aviation art. Of course, I also love your men’s adventure magazine cover paintings and interior illos, which actually included some early examples of your aviation art. COHEN: I don’t have a problem with that. It does bother me when people only know my work from those years. It’s amazing how people pigeonhole artists. People who only know my work as somebody back in the Fifties and Sixties who did action-adventure. And when I see bios that say “Gil Cohen, late 20th Century artist,” what the hell am I to say? They’re assuming that’s what I did. I was born to do action-adventure magazines and that’s it. If they would bother to Google my name, they would see a lot of very current stuff. 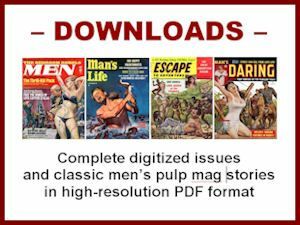 How do you view your men’s adventure and pulp paperback art from your perspective today? COHEN: I’m still proud of what I had done. Some of it was raunchy. And, some of it might be considered dumb, I guess. But look, it paid a mortgage and it helped raise kids. I did it. And, I worked hard doing it and it was a great learning ground for me. You don’t stop learning when you graduate art school. [Cohen is a graduate of the Philadelphia Museum School of Art, now part of the University of the Arts in Philadelphia, and he also taught there for 21 years.] You continue to work and learn your entire life. Well, one of the great learning times of my life was doing those illustrations so rapidly and learning to do them decently. So, when they ask for a battle scene you don’t have stage fright anymore. You can do it. And, if need be, I’d be up all night doing them. I don’t do that anymore, believe me. I’m not nearly as prolific now and don’t wish to be. But back when I was young I stayed up all night or all hours of the night working, coffee-ed up. Now, I don’t work after dinner. Once my wife calls me and says ‘hey, let’s have dinner,’ I leave the studio and I don’t come back to it. I read in the book about your aviation art that you spend a long time doing research on the paintings you do now. COHEN: Yes, the paintings I do today I take a great deal of time with. I do research very, very carefully. I do a lot of interviews [with pilots, eye-witnesses and other experts]. It takes me months to gather research, to shoot reference photography, to do sketches, and then the final painting. The final painting itself, from the start, a blank canvas, to the finished painting, will take typically two, three, sometimes more months. That’s the difference. I love the way in your book you show photos of the process. COHEN: Yes, you see something of that. And, it’s not that I didn’t have a similar process back then, when I was doing men’s adventure magazine illustrations, but it was short-circuited. You had to do it quickly. You couldn’t just examine and think about it and take the day off and decide what you’re going to do the next day with the painting. You had to meet hard deadlines. Today if someone came to me with a commission and said they want it next week, or even next month, there’s no way. I don’t choose to work that way anymore. I’m painting the way I always imagined I wanted to paint when I was in art school. I’m closer to that than I was during my regular career. In my regular career I did magazine art, book covers, movie posters and a lot of different stuff. 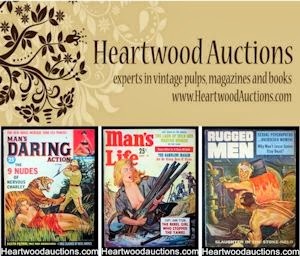 Rich Oberg, the noted men’s adventure art expert and collector, has quite a few of the original paintings you did for men’s adventure magazines in his collection. Some are cover paintings, but a lot are duotone paintings you did for interior illustrations, which I especially like. COHEN: Oh yeah, I loved doing duotones. One color was always black, obviously, because the type is set in black. The second color could be anything. And, I loved warm colors such as brown or orange as a second color. And red is fairly good. I didn’t like blues and greens. They were more difficult to work with, the cool colors. But the warm colors, especially orange was great, because you could have all semblances of grays and browns, beautiful tones of browns, and here and there maybe a bright orange. And, so it gave me a lot of latitude. Oh yeah, I loved duotones. 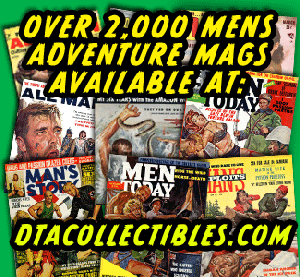 How much time were you given to do an illustration for a men’s adventure magazine? COHEN: You know, of all the questions I’m ever asked, ever, the most frequently asked question is “how long did it take you to do that?” Nowadays, I’ll be a little bit of a wise guy and I’ll say 79 years. And, there’s some truth to that. Everything that came before goes into a painting. Everything in my life is imparted into it. Gil went on to tell me he would typically be given anywhere from a few days to a few weeks to complete an illustration assignment for a men’s adventure magazine. He also told me a hilarious anecdote about the very first men’s adventure illustration assignment he was given, by the art director of Real magazine in 1953. It’s in Part 2 of my interview with him, online at this link. Comments? Corrections? 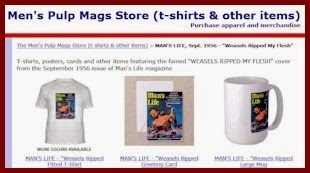 Post them in the Men’s Adventure Magazines Facebook Group.